Casa Cuervo, one of the largest, oldest and most prestigious Tequila manufacturing companies in Mexico has become user as well as promoter of the RollerForks among its clients and suppliers. The agave plant, the main ingredient of tequila, takes between 8 and 10 years to reach maturity and must be harvested by hand. Using a coa de jima or hoe, the harvester, known as a jimador, cuts away the spiky leaves to reveal a large pineapple-shaped heart called a piña.The piñas are slow baked in clay ovens for two days until soft. Once cooled, they are crushed and strained to extract juice. They are then milled to extract the remaining juices. The liquid is mixed with natural spring water in large fermentation tanks and yeast is added. This mixture is fermented for 7 to 12 days before being twice distilled in pot stills. Ageing in oak barrels produces Cuervo’s distinct colour. In 1758 Jose Antonio de Cuervo obtained land in Mexico to cultivate agave plants from the king of Spain before it became an independent republic. In 1795 King Carlos IV of Spain transferred the land deed to the second Jose Cuervo, Jose Maria Guadalupe Cuervo and granted him the first concession to commercially produce tequila. 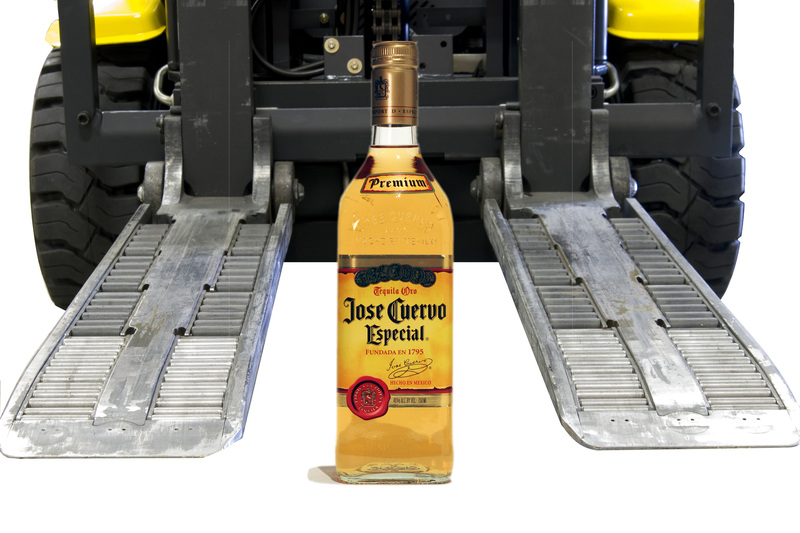 Several years ago, Casa Cuervo eliminated the use of standard wooden pallets in most of their operations and started the use of slip sheets and the well known Push Pull attachments. 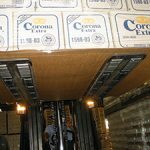 After Paperboard Products de Mexico, SA de CV was appointed by MSE Meijer Special Equipment as the Exclusive Distributor for the Mexican Republic, efforts were conducted to introduce Casa Cuervo to the use of the RollerForks to replace the existing Push Pulls. 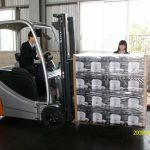 The Management immediately saw several important advantages by using the RollerForks not only for internal use but also as a tool among its clients to promote the use of slip sheets instead of pallets to not only get very significant savings in costs but also be more environmentally friendly by felling less trees. Casa Cuervo is even promoting with its largest clients, offering to purchase the RollerForks and let the clients use them for free if they decide to receive the goods on slip sheets. Casa Cuervo is now part of Diageo who is the world’s leading premium drinks business with an outstanding collection of beverage alcohol brands across spirits, wines and beer categories. Besides Casa Cuervo products, Diageo has brands such as Smirnoff, Johnny Walker, Captain Morgan, Baileys, J&B, Tanqueray, Guiness, Crown Royal, Beaulieu Vineyard and Sterling Vineyard wines and Bushmills Irish Whiskey.